One couldn’t have asked for a better weekend in a city known for fog and rain. Arriving Friday afternoon, there wasn’t a lot of time to do much in the way of touristy things and sightseeing, plus I had already done that plenty my last couple visits to this jewel of the great Northwest (my last time being the first Progman Cometh festival so many years ago), my sole mission on this weekend was seeing this second edition of Seaprog, after sadly missing the inaugural event last summer. Seattle is a busy city of hills and bridges, a juxtaposition of homes, businesses, industry, waterways and greenery, with streets going every which way as I made my way from where I was staying – a quiet basement near Lincoln Park – to the area of the venue in an older section of town called Columbia City. Friday night’s event (“Day Zero”) at the Royal Room was free with a two drink minimum, whereas the Saturday and Sunday events were hosted at the beautiful Columbia City Theater just across the street and a couple doors down for about the cost of one average dinner for two. Considering that sixteen artists performed here over the course of the weekend, this is a very fair price. At the Royal Room there was still plenty of seating at the early hour I arrived, mingling with my friends and rekindling some old acquaintances while waiting for the first performances of the night. Friday night’s opening band Autumn Electric was one of only four bands of the entire weekend that I already had some familiarity with, thanks to downloading their latest, Flowers for Ambrosia, following Jon Davis’ review of it a couple months ago. Indeed, this Seattle-based five-piece more than any other band of the weekend exemplified the traditional progressive rock sound, with dedicated lead singer Michael Trew being the focal point of the band, telling stories and doubling on flute and second guitar, with vocal harmonies provided by keyboard and melodica player Naomi Adele Smith and bassist Johnny Unicorn, whose solo releases we have also covered several times on this site. Rounding out the band is the very impressive lead guitarist Max Steiner and drummer Chris Barrios. This is a band that follows the traditions of progressive rock while injecting their own contemporary ideas, without sounding like any other bands in particular, although the bassist wore a Phideaux shirt, and some parallels might be found therein. They only played about six songs, but when you consider that one of those six, “Orange Stars,” is a lengthy multi-part suite that approached the half hour mark, and a couple others easily hit ten minutes, this was a solid hour-long set of great music and a great start to the festival. After a set change and some technical problems with a midi-mallet controller unit, Fang Chia, a four-piece from Tacoma took the stage. 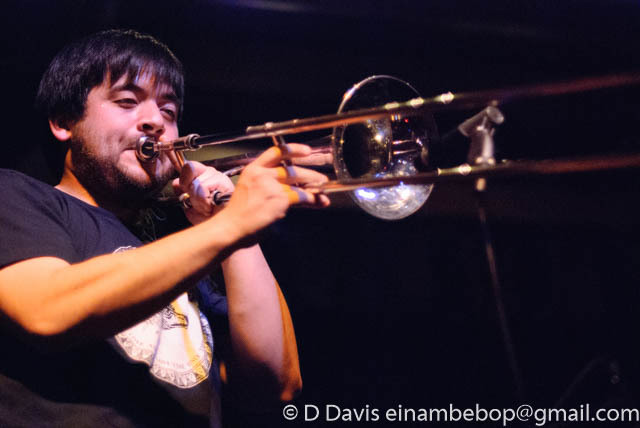 The de-facto bandleader is bassist Kevin Shintaku, who doubled on trombone, introduced the other band members (guitarist, drummer, and percussionist) noting that the band’s regular keyboard player (who doubles on trumpet, vibes, and percussion) was away for the summer. 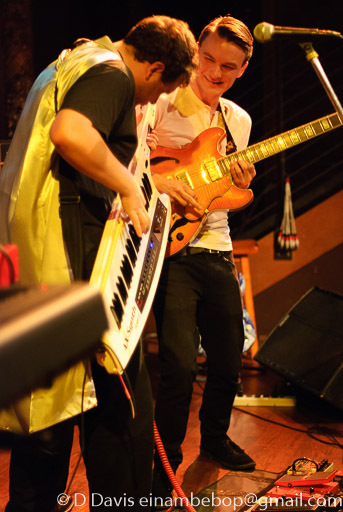 Thus the percussionist and drummer were doing their best to cover the keyboards on Friday night. Their sound could best be described as a mix of experimental jazz and rock with healthy doses of African rhythms and electronics blended in. One couldn’t always hear the percussion, which was down in the mix for some reason, and there was a lot of instrument switching. Some of the band’s finest moments were when the core bass, guitar, and drums were going it alone, almost reaching the heights of 70s Crimson (think “A Sailor’s Tale”...) as the power flowed and ebbed throughout their set. This was something completely different than the first band, and indeed began to set the tone for the variety of musical styles to be heard throughout the weekend. After an hour of cerebral experimental jazzy sounds, the next band provided exactly what was needed to pick up the pace and crank the energy level into overdrive. While I had never heard of Badwater Fire Company before, it was clear they had their own set of fans that showed up just prior to the beginning of their set and filled the room, including this bearded dude with top hat and suspenders who danced throughout their entire show. 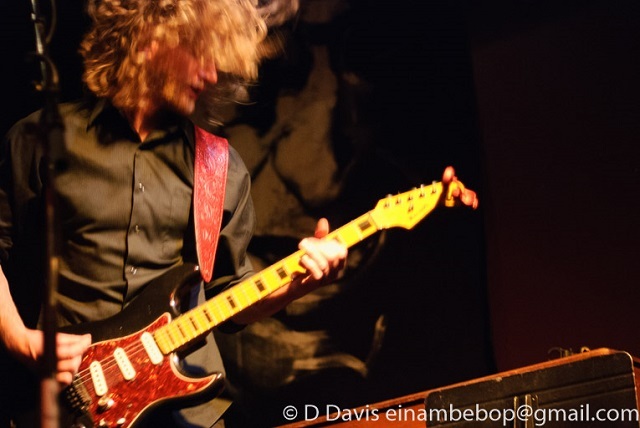 The band is a classic guitar trio led by guitarist, songwriter, and singer Shane Rossmiller, flanked by bassist Michael Pearson and drummer Matthew Singler. Rossmiller is a solid singer and an outstanding guitarist, and their sound came off reminding me of Caress of Steel era Rush with a bit more math in their mix, but sounding very fresh and contemporary; while interesting and engaging, each song bore more than its share of emotion. Just when it would seem like they were about to burn the place down, they would back off a little for a few minutes’ respite with some tasty licks before launching back into the heavier rock again. A powerful set that closed the evening on a high note. 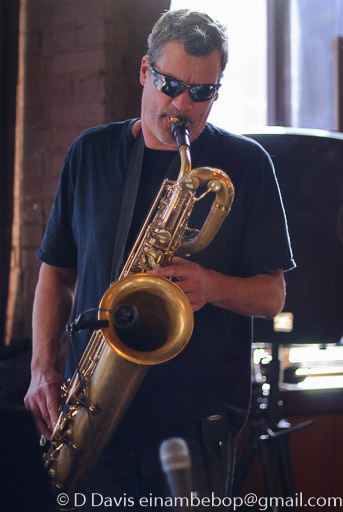 The first band up at Columbia City Theater was also the one with the coolest name – a Seattle based quartet of experimental jazz and avant-rock improvisers called Spontaneous Rex. Guitar, keyboards (with a long silver cape), bass, and drums come together in a very effective way to create something not unlike 70s jazz-fusion with blistering intensity, occasionally pulling back to more tasty and controlled passages where each of the members gets his opportunity to shine. Most notable were some beautiful keyboard parts (mostly using an electric piano sound) that were offered up as intros and outros to the band’s busier pieces. Much of what they did seemed more composed than improvised, or at least very thoroughly rehearsed improvisation. 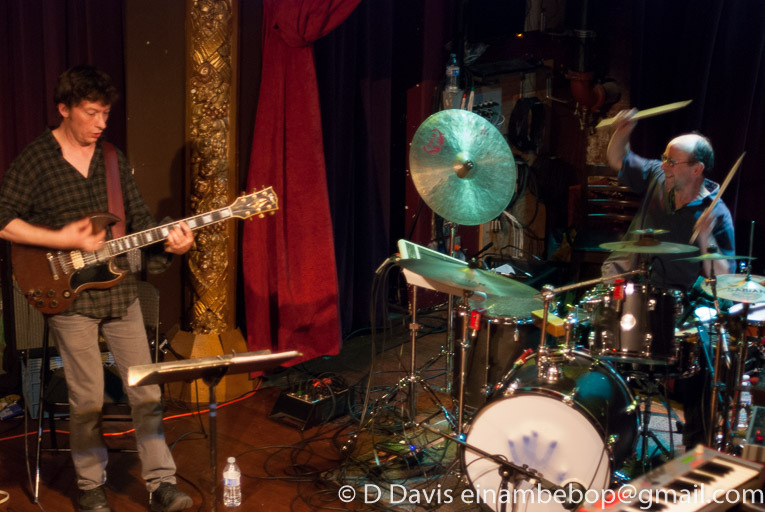 The band played several lengthy compositions with multiple sections, mostly material from their first full-length release, the brand new Come at the King, which is available on Bandcamp. They finished with "Spaceman Spiff," the album's closing piece, which features dramatic synthesizer sections and throbbing rhythms. There was a tall gentleman with very long hair and suspenders present at all of the performances so far; I figured he was just another prog fan from the Seattle area. Not so. 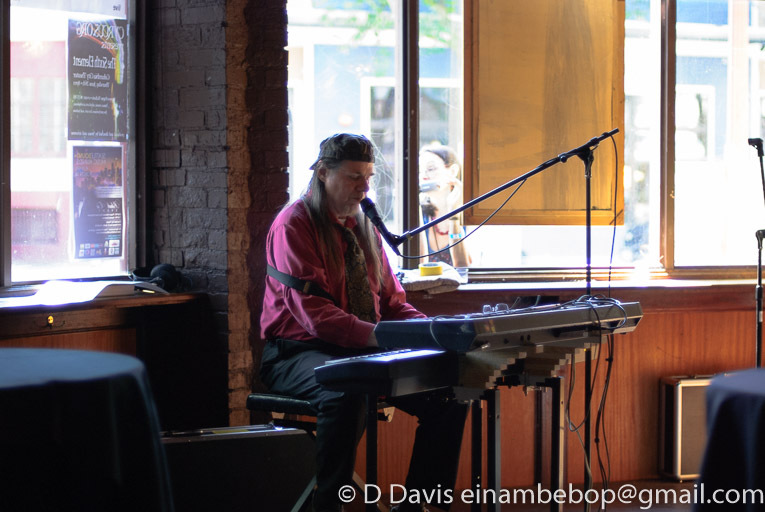 In the front room, between sets, there he was singing with his keyboard and flute, billed as Baribrotzer Solo – his real name is John Hagelbarger, also a member of local four-piece prog rock outfit Dissonati, who appeared at last year’s edition of the festival. Apparently this was his first appearance as a solo performer, and although very interesting as a rough-draft avant-garde songwriting exercise, I couldn’t help thinking of how much the songs could have benefited from a full band treatment. On his last number, donning his tinfoil covered Uncle Sam top hat, he entered the sphere of domestic political commentary with an attack on the Tea Party. Interesting set that filled the break between major acts nicely. I remember one year at Baja Prog there was a certain trio claiming that they were the loudest band in NYC, and once they started playing, they promptly cleared the hall and filled the lobby. Sadly, that was the role of Spacebag at this festival – a trio of guitar, keyboards, and drums. As they started I was hoping that the ‘space’ in their name might align the band with the Hawkwind/Ozric axis, but after a couple songs it was clear that was not where they were going; this was straight-up instrumental metal. After their first song I headed out to the lobby area to get some of the ear-plugs that were being provided for free, but upon returning, although the painful volume levels were reduced, the brutal levels of distortion were not, so after a total of about four songs, I exited to start an early dinner break. Following an excellent meal at the Island Soul Restaurant (a shameless plug for an outstanding eatery a couple blocks away), I wandered back into the front room at Columbia City Theater and was immediately consumed by beautiful sounds coming from what at first sounded like a bowhammered dulcimer, reminding me of Cloud Chamber’s Michael Masley, but on closer inspection turned out to be Jim Bartz playing an eight-string lap steel guitar with a movable sliding bridge (a 1939 Rickenbacker he calls the “Big Whoop” on his website). 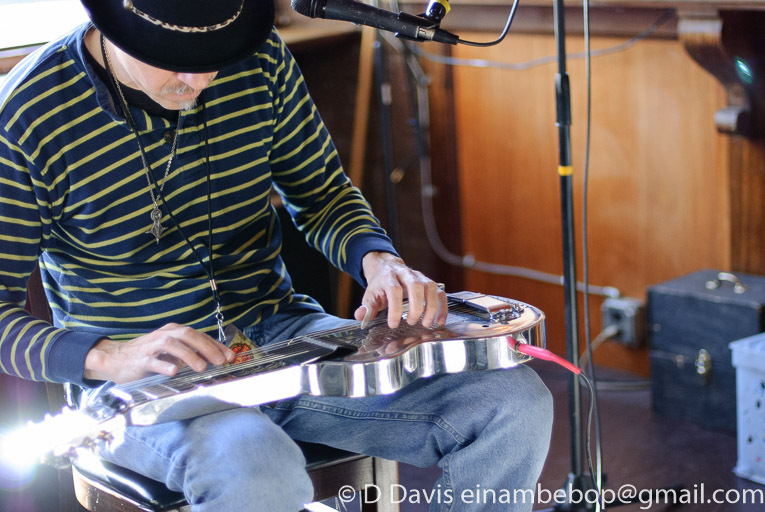 Since he was playing on both sides of the bridge, the notes just flowed out freely in kaleidoscopic colors, filling the room and transfixing the small but appreciative audience of attendees arriving back early from the dinner break. Sadly it was only a half-hour set of sounds I could have listened to for an hour or more. Apparently Bartz hasn’t recorded any of this yet, his only CD on the table was a compilation of material from his three earlier ambient releases. So we have something to look forward to. Last year at Seaprog, Thinking Plague was the headline act, and prior to their appearance in Seattle they did a warm-up gig in Portland, Oregon, with local trio The Mercury Tree opening for them. Legend has it that both bands came up to Seattle – one to play and one to hear and see if they could secure a place on this year’s bill. And so this year was The Mercury Tree’s opportunity to perform, and they were the first band following the dinner break on Saturday, making quite a few converts in the process. The Mercury Tree performed half the set with their outgoing bassist, and half with their new bassist just coming on board – the latter who did a brief cookie monster cameo vocal in the first part of the set... Guitarist, keyboardist and lead singer Ben Spees fronts the band with a vocal vaguely reminiscent of Steve Hogarth, but that’s where the similarities with Marillion end. 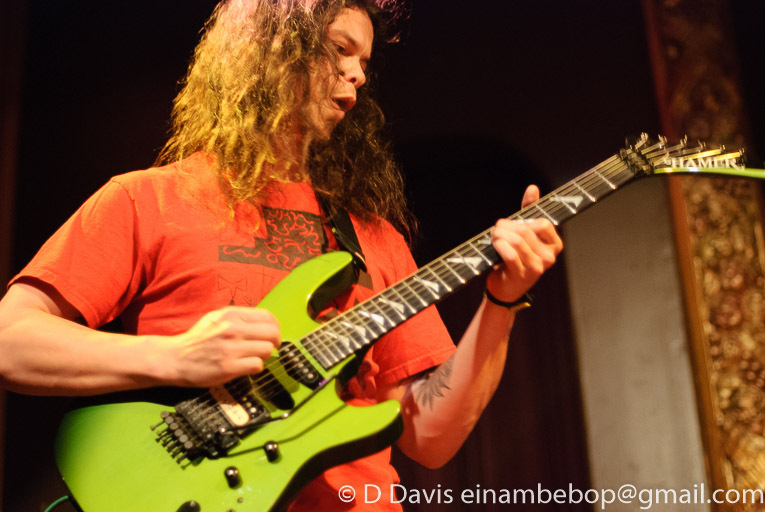 The drummer (Connor Reilly) and bassist (whichever one) provide some solid vocal harmonies, but the band may be remembered more for their edgy instrumental attack not unlike mid-period Rush with a bit more of a math component. Most of the songs were built up of interlocking loops Spees recorded live on both guitar and keyboard, resulting in a sound much more varied than a trio might normally produce. Needless to say there were a lot of newly converted fans walking out of the hall at the end of their set. Those fans were then met in the front room by one of he most interesting acts of the weekend. No guitars, no basses, no keyboards and no drums, Tempered Steel is a trio of three kalimba / mbira players (Ffej, Frank Junk, and Dennis Rea, one of the festival’s organizers and leader of the band Moraine) accompanied by effects and electronics, for a true sample of avant-garde improvisation at its finest. 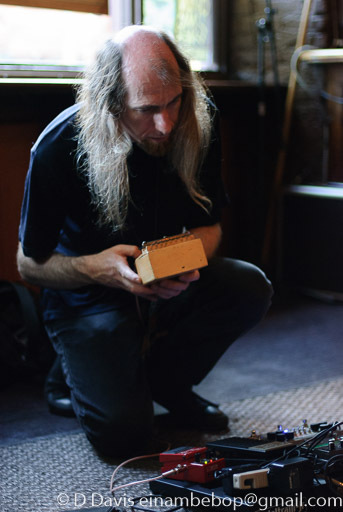 Of course one hears the acoustic properties of the instruments, but at the same time they are used as triggers for an array of unusual electronic sounds, amplified and heavily processed. It looks astonishingly simple to see the three players in action, until one looks down at the floor and the array of pedals, triggers, and effects boxes. The overall effect is magical, like a tapestry of interwoven textures, sometimes synchronous, sometimes completely free, often vaguely reminiscent of Indonesian Barong without the dancing and storytelling, all processed through some kind of mysterious dream, or maybe some outtake of some of Harry Partch’s more obscure work as an alternate point of reference. It was all over in around 30 minutes but left an impact that won’t soon be forgotten. There were a few copies of their CD for sale, one of which I scooped up promptly. What more can be said about Miriodor? Since the early-80s the band have proven themselves over and over with a long string of excellent releases. Tonight the band was a four-piece of founding members Pascal Globensky (keyboards) and drummer Rémi Leclerc, with longtime guitarist Bernard Falaise and relative newcomer Nicolas Lessard on bass. Following their latest 2013 release, Cobra Fakir, they appeared here thanks to a grant from Le Conseil des Arts et des Letres du Québec. As one might expect from their numerous appearances at other festivals worldwide, theirs was a well rehearsed set of tightly composed instrumental pieces from most of the band’s recent releases, drawing on folk themes, chamber music, classical, progressive rock savvy, touches of jazz and musical humor, all rolled up into their unique avant-rock signature. Their set was notable on numerous levels, with amazing instrumental interplay between the four members, and the audience was thoroughly captivated from their first number to the encore. Many expected Miriodor’s set to be the highlight of the festival, and there’s no doubt that anyone leaving the hall at the end of their set agreed that it was. But there was still another full day of music to be experienced. First up on Sunday was the band I had most anticipated seeing, and actually the biggest draw for me only because I had encountered their CD several months ago; I’m sure that most folks in the hall had no idea what they were about to witness and hear with Zubatto Syndicate. This is a big band, twelve members, although I only counted eleven on stage – apparently the clarinet was playing hooky that day. The focal point of the band is guitarist and composer Andrew Boscardin, who doubles as spokesman and conductor (no baton, sorry). 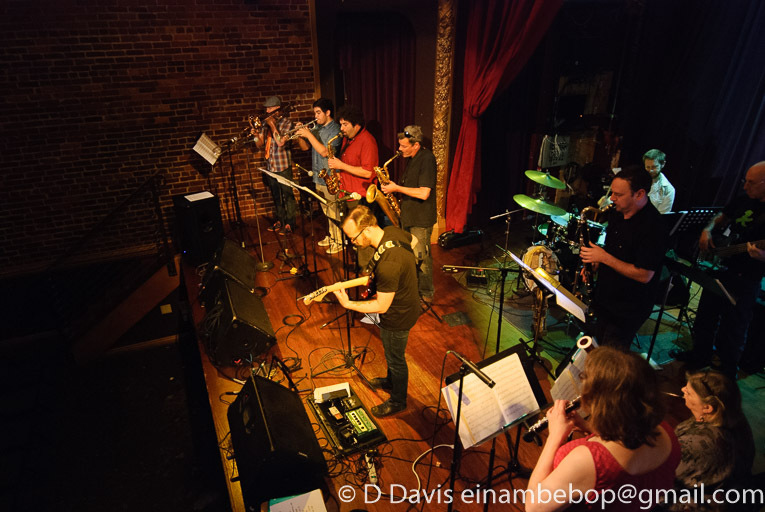 From left to right across the left stage front line we have trombone, trumpet, alto sax, and baritone sax, and behind them sat the keyboard player. On the right side of the stage were tenor sax + bass clarinet, bassoon, and an almost inaudible oboe. Behind them was the electric bassist, and way in the back was the drum kit. That’s a lot of players to keep in line, most reading their parts from charts, but Boscardin was up to the task as they smoked through about a dozen cuts mostly culled from their eponymous CD. 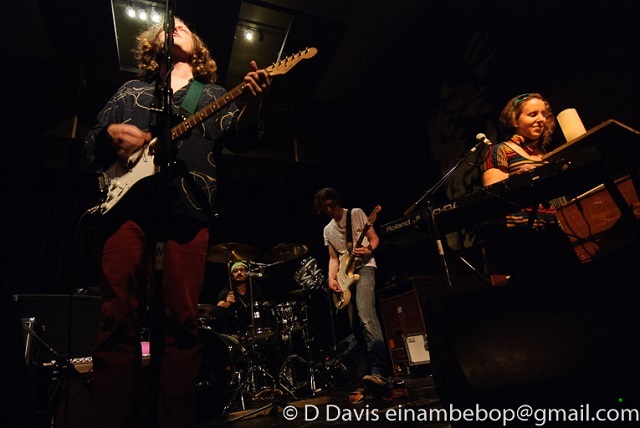 Their sound is a big-band mix of jazz and rock with healthy blasts of brassy funk, not at all unlike some of Zappa’s Grand Wazoo or Hot Rats material, just a bit less orchestral and immensely more funky. I was transfixed throughout their entire set. The name of the next band made me reminisce back to my college days when I played bass in a band in Colton, California. Even though we sounded more like Commander Cody or the Grateful Dead, the lead guitarist was pushing the idea that we should change the name of the group to “Son of Hendrix.” How could we possibly live up to that name? So here, so many years later, I’m faced with a band with the name Being John McLaughlin – I mean those are some big shoes to fill, and McLaughlin has so many different aspects to his sound. What was this band going to do? 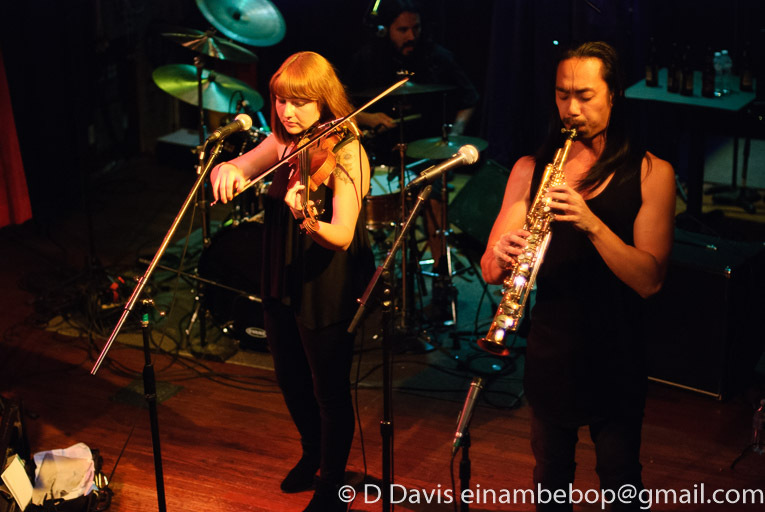 Once the band took the stage – guitar, violin, keyboards, bass and drummer, I had a pretty good idea where they were going. Yes indeed, a nice long set of Mahavishnu Orchestra material culled from Inner Mounting Flame and Birds of Fire only, played impeccably by this band of consummate professionals. Filling McLaughlin’s shoes quite capably is guitarist Tristan Gianola, with Alicia DeJoie at stage left playing violin. The bandleader here is actually keyboardist Ryan Burns, with the rhythm section of John Bishop and Geoff Harper on drums and bass respectively. This was definitely a fitting tribute to a couple of the most groundbreaking albums ever recorded, fully capturing the adventurous nature of the music, not just imitating the original. Following the dinner break, attendees were met in the front room with an improvising trio of Chapman Stick / theremin, baritone sax, and drums billed as Super Z Attack Team, themselves a 3/5 subset of the band Zhongyu (who opened the festival last year at the Royal Room). Their set seemed like a fertile experimental workshop of ideas, encompassing effects and electronics as well, alternating between more aggressive passages and ambient interludes. The crowd was extremely attentive as they worked through around six composed pieces bridged by improvisations into a continuous flowing 40 minute set, which included some spoken words from the sax player (Jim DeJoie, who also played in Zubatto Sydicate) about traveling in India, and there were samples of electronic sounds and voices like JFK, Maya Angelou, and samples of shortwave radio recordings. Overall this was a very interesting set that offered a lot of unexpected surprises, combining rock, jazz, and electronics seamlessly, with some recurring rhythmic motifs to hold it together. Apparently a Zhongyu album is in the works, but this trio, with almost a completely separate repertoire, remains solely a live entity so far. Corima from Los Angeles was another big draw for me personally. 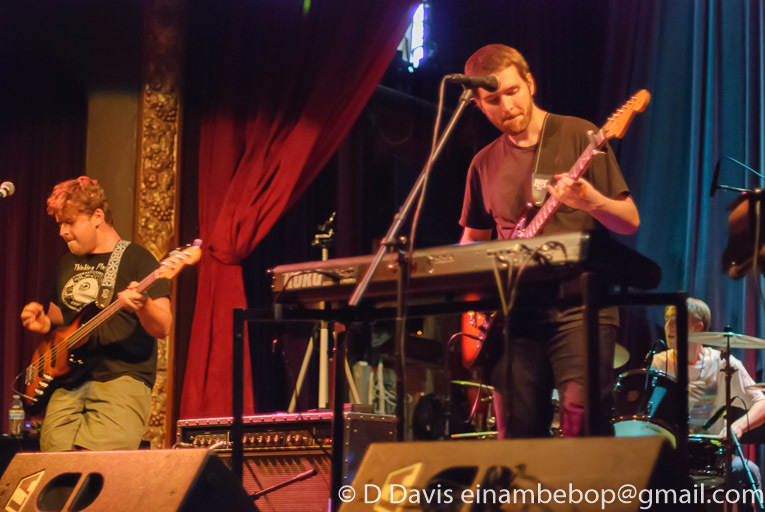 Having reviewed their most recent release, Quetzalcoatl, I was fairly certain that their set would be a mind-blowing experience, but even I was not prepared for the intense performance this five-piece delivered on Sunday night. Although he will say the band has no leader, the on-stage focal point is drummer Sergio Sanchez, who along with keyboardist Francisco Casanova, violinist Andrea Calderón, bassist Ryan Kamiyamazaki, and sax player Patrick Takashi Shiroishi – several members share the vocal duties – deliver a sound that is in many ways comparable to Magma at their mid-70s peak, further underscored by the fact that the band has no guitarist. At times the energy reached such high levels that the audience seemed to be in a trance while the band carried onward with their lengthy multi-part suites. This was not the band’s first appearance in Seattle, but it may well be one that is never forgotten by anyone who witnessed it. The good news is that their entire set was recorded, though no plans for release are imminent. Out in the front room again, I was thinking that after Corima, anything else would have a difficult time measuring up. But with an unexpected twist, Seattle based trio The Pornadoes took to the small stage and delivered a fun set of retro instrumental tunes that at times sounded like a high intensity collision between Chet Atkins and The Ventures, and at other times delivering a spacy ambient guitar sound that might work well as motion picture or TV soundtrack music. 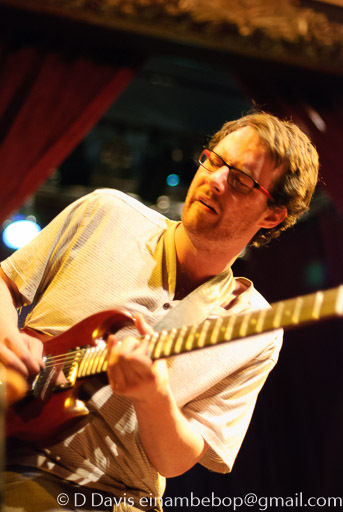 At the helm is guitarist Jason Goessl, whose chops are matched only by his imaginative compositions fusing surf-rock, instrumental country, and fun pop ideas from times long gone into something new and respectful of rock’s early history, and having a whole lot of fun while doing it. 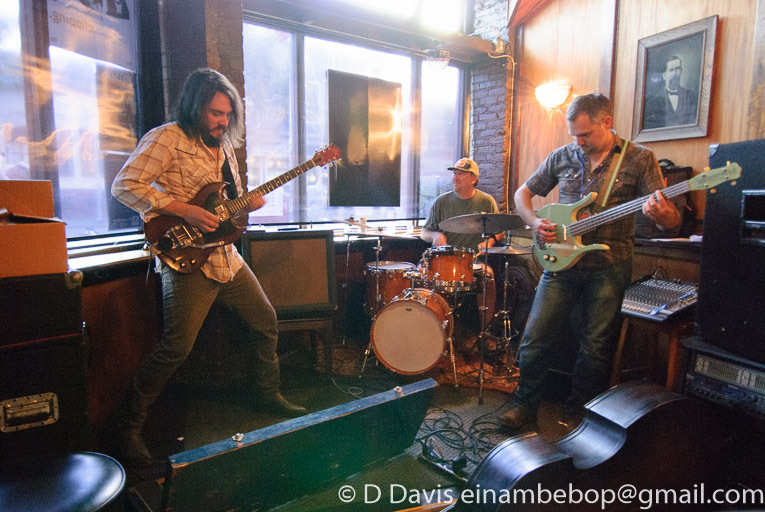 The trio is rounded out by bassist Ethan Sobotta and drummer Tom Zgonc, who all seem to be dialed into the same wavelength. Sadly, their set seemed to be over too soon; I could have easily listened attentively to what they were doing for an hour or more. The band had two CD releases that were available at the event. I assumed that the reason Midday Veil was the Sunday headliner was because they had a strong local following that would turn out for their show. Not the case, in fact the crowd had thinned out quite a bit by the time of their set, and as I scanned the crowd during their first number, about half those that remained seemed to be members of other bands that had already played. Did everyone else leave early? 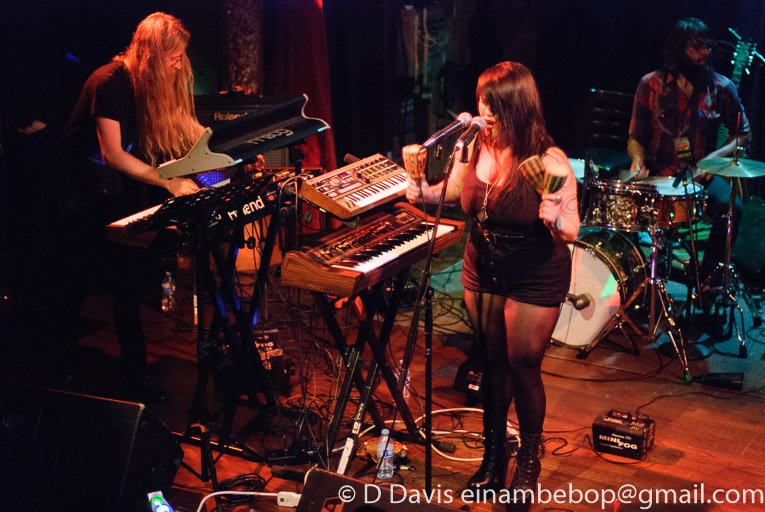 The band is a six-piece, with a dedicated keyboard player and a female lead singer who also doubles on keyboards, a drummer, bassist, guitarist, and a dedicated percussionist (with a hand drum kit). Their opening number was a long drawn-out keyboard drone that eventually morphed into a slow-paced vocal piece with the others adding minimal accompaniment, the singer’s style and the entire band’s approach was very much in the shoegazer style. On their second number all that changed with the heavy synth-drum bed that brought them more into a techno-space-rock sound, the drummer and percussionist laying their work over the synth groove. This is pretty much where their style remained for most of their set, with singer Emily Pothast punctuating each piece appropriately. Midday Veil’s style tends to be more about texture, grooves and repetition. I’ll be honest here: at first I found the band a little boring and predictable but by the middle of their set I realized they were slowly winning me over. It was after their cover of Amon Düül’s “Archangels Thunderbird” near the end of their set that their entire approach came into better perspective, although I still think they would have worked better in an earlier time slot. There you have it. A full weekend of great music and more than half of these sixteen artists I had never heard before seeing them here at Seaprog. Also it was nice to touch bases with a lot of folks I hadn’t seen in many years. While the attendance was not spectacular (only Miriodor’s set approached capacity) hopefully the promoters will find a way to keep this going next year and increase the visibility and attendance in the process. Here's the official photo gallery.